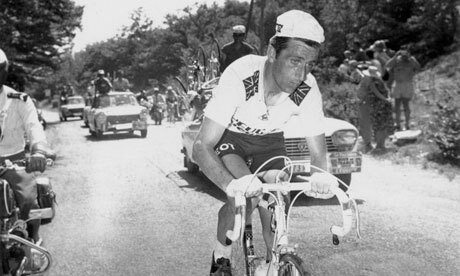 In the 1967 Tour de France, Tom Simpson, one of the greatest cyclists from Great Britain, has died while climbing Mont Ventoux, the “Giant of Provence”. Tom Simpson climbing Mont Ventoux, 1967 Tour de France. He collapsed and died a few minutes after this photo has been taken. Born in Haswell, County Durham, in 30 November 1937, later moving to Harworth, Nottinghamshire. He began road cycling as a teenager before picking up track cycling, specialising in the pursuit discipline. On the track he won a bronze medal at the 1956 Summer Olympics and a silver at the 1958 Commonwealth Games. After switching the road cycling, he won , Tour of Flanders (Ronde van Vlaanderen) (1961), Bordeaux–Paris (1963), Milan – San Remo (1964), Giro di Lombardia (1965), and Paris–Nice (1967). He also became the UCI World Champion in 1965 in San Sebastian. In 1967, he also won 2 stages in Vuelta a España. The 13th stage of the 1967 Tour de France measured 211.5 km (131.4 mi), started in Marseille, went over the 1,910 m (6,270 ft)-high Mont Ventoux, the “Giant of Provence”, before finishing in Carpentras. As the race reached lower slopes of Mont Ventoux, Simpson – still suffering with illness – was seen ingesting a number of pills with brandy. As the race closed in on the summit of Ventoux, the peloton began to fracture, and for a while, Simpson managed to stay in the front group of elite riders; he then started slipping back to a group of chasers around one minute behind. He then began to lose control of his bike zig-zagging across the road. One kilometer from the summit, Simpson fell off his bike. Taylor and the team mechanic, Harry Hall, came from the team car. Hall tried to persuade Simpson to stop when he fell, saying “That’s it for you, Tom.” But Simpson said he wanted to go on. He said ‘My straps, Harry, my straps!’ Meaning that his toe-straps were still undone. They got him his bike and pushed him off. Simpson’s last words, as remembered by Hall, and by Taylor, were ‘On, on, on.’ The words “Put me back on my bike!” were invented by Sid Saltmarsh, covering the event for The Sun and Cycling, who was not there at the time and in a reception black-spot for live accounts on Radio Tour. He managed to ride a further 500 yards (460 m) before he began to wobble and was held upright by three spectators. He was unconscious with his hands locked to the handlebars. Hall and a nurse from the Tour’s medical team (see comments) then took turns giving Simpson mouth-to-mouth resuscitation, before Dumas came with an oxygen mask. Around 40 minutes after his collapse, a police helicopter took Simpson to a hospital in nearby Avignon, where he was pronounced dead, with official time of death at 5:40pm. Two empty tubes of amphetamines and a half-full tube were found in the rear pocket of his racing jersey, one of which was labelled ‘Tonedron’. 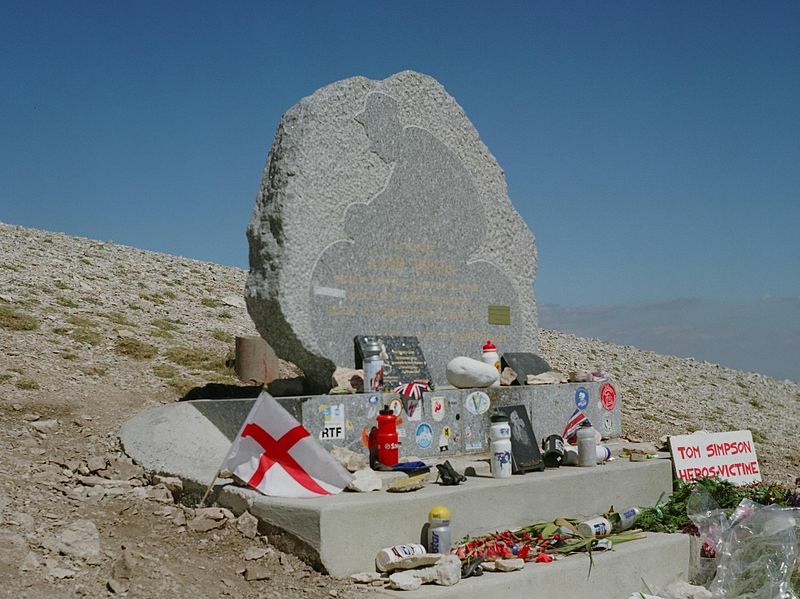 A memorial stands close to the spot where he died and has become a pilgrimage for many cyclists. A book, named “Put Me Back On My Bike – In search of Tom Simpson” by William Fotheringham tells the story of Tom Simpson. 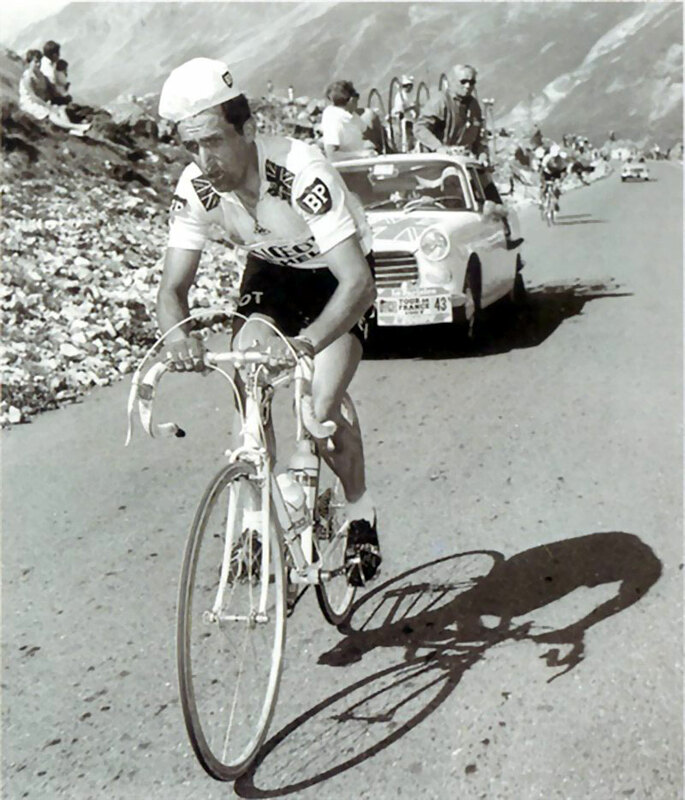 Tom Simpson is climbing Mont Ventoux in the 1967 Tour de France.